Excavations at Middle Barn, Selhurst Park, Eartham uncovered a Middle Iron Age to early Roman farmstead, sitting upon the southern slopes of the South Downs in West Sussex, and overlooking the Sussex coastal plain. Few such excavations have been undertaken on the Downs in recent decades and even less on such a large-scale. While the structural remains were unremarkable for a site of this type, consisting of the probable remains of three roundhouses, surrounded by a network of ditched enclosures, the recovered artefact assemblages were substantial and important. Of particular note were three large pits, cut into the chalk, and backfilled with structured deposits of pottery, animal bone, grain and fired clay. Not only do these bear testimony to notable Iron Age feasting events, but their assemblages fill significant gaps in our understanding of regional pottery traditions and agricultural practices from the Middle to the Late Iron Age. These results can now be compared with those coming from the surge in developer-funded excavations on the coastal plain below. The resulting wealth of new evidence relating to Iron Age and Roman occupation there provides a whole new backdrop for the understanding of what was happening on the Downs to the north. It is hoped that the publication of the results from these excavations will contribute to the debate over how these two topographies interrelated, particularly in the context of expanding cross-channel trade during the later Iron Age. 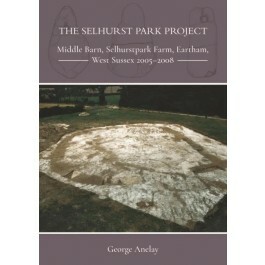 The excavation project at Middle Barn was carried out in 2005–2008 by volunteers under the direction of Chichester District Council’s Heritage Outreach Officer.